Forty pounds, a bushel, of purchased pears,$25.00, were allowed to ripen for four days and made into 37 liter jars of pressure canned juice. The stem of the pear was pulled off and the fruit cut into quarters to facilitate cooking.Water was added to the pot to cover the pears. Two batches of 20 pounds each was required. 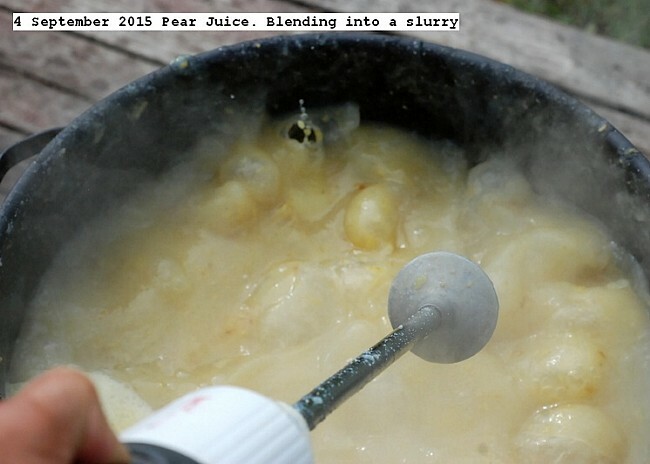 The pears were cooked until soft about 20 minutes, then blended into a homogeneous slurry. The slurry was strained through a food mill with a mesh of 2mm to remove all extraneous material. The residue of the food mill was put through a Champion Juicer to extract all nutrients.The strained juice was placed in liter jar and pressure canned at 15 PSI for 15 minutes for long term storage without refrigeration.Pictures depict the processing. This entry was posted in Uncategorized and tagged 4 September 2015 Pear Juice, Pear juice. Bookmark the permalink. http://durgan.org/2011/?p=4901 My method and justification of the method of presure canning.